Hearts to Hands is holding a Christmas Love Box drive, where we aim to give 800 + under privileged children in poor families a Christmas present.We invite “YOU” to take part in this exciting and fun project to make a difference and bring a smile to a poor and needy child’s face this year. Bring a wrapped shoe box and fill it with presentsas per suggestions on list below. · Copy of list detailed below. spoilsthat they would not normally have. · Anything else that you want to add is very welcome. Last weekend, Hearts to Hands and CAST held a Blanket Drive Campaign at The Village Market Centre. This campaign was linked to the Fitcampathon Winter Warmth Program in which participants have free entry into the Fitcampathon but are asked to donate a blanket towards those that are less fortunate this winter. The day brought in about 200 participants who donated about 250 blankets as well as clothes. Hearts to Hands even managed to recruit some potential future volunteers for the ministry. One of the highlights of the day was when a team of “rough and tough” Harley Davidson crew pitched up to take part in the Fitcampathon, holding a heap of blankets for the homeless in their hands…big men with big hearts! Another highlight was having both the Westville Times and the Highway Mail interested in covering the story of the day. It’s awesome to know that the community is getting more involved in what CAST is doing. The biggest outcome of the day was that Village Market has decided to adopt Hearts to Hands as it’s CSI Project – which means they will be giving the ministry exposure in the centre for all projects we want to run. This will include our Christmas Lovebox Project and 1000 Snowflakes Foodparcel Campaign, both set to take off in the next couple of months. The Woolworths branch in the centre has also offered to donate frozen foods towards our food parcel recipients, which is a huge blessing for the ministry. The blankets and clothes were distributed to families and food parcel recipients throughout some of our communities during intentional outreach days at KwaDabeka and Noordsberg – the heart of Jesus is so evident when we witness the joy that blessing others can bring. We are very excited for what God has in store for the Hearts to Hands ministry and so grateful for the contributions people made towards our Blanket Drive. Watch this space for the next campaigns! Debbie and Ernie Calder, two of CAST’s devoted volunteers, had a story and message for everyone this week. We feel moved to respond to the message Pastor John brought to the church under the heading “God in our Country”. John referred to Nehemiah returning to Jerusalem to build the city wall. This wall was important to the people. We also have walls to build in this country …and bridges. Pastor John’s message also said “start representing and displaying God by being salt which preserves and light which shows His Kingdom in this world -by doing good. Noodsberg Baptist was built 30 years ago by WBC in the 1980’s. Pastor Ephraim is the original pastor, who still leads the church. Two other churches in the area have been planted by him, one in Applesbosch and one in Chibini. The lack of water in Noodsberg was a huge problem for this community. Even though the government had laid pipes, there was no pressure to push the water up to the church. 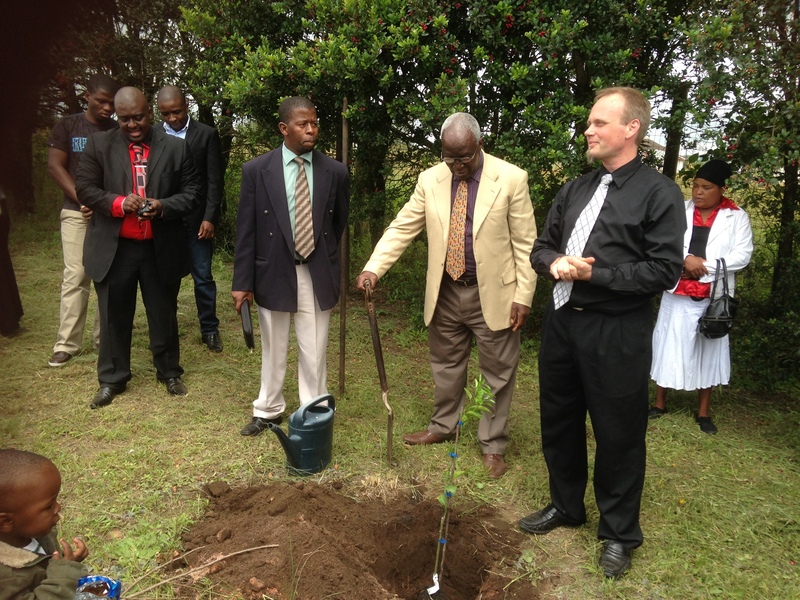 A borehole was therefore considered and with the financial support of a visiting missionary, was finally installed. The ground was drilled, the pump and water tank were installed. The ground was ploughed and soil testing in the process of being done. Then came the news that the water had stopped and possibly dried up. We questioned God’s purpose when this happened but it wasn’t long before His plan was revealed. Aqua Earth, the borehole company, was able to send a consultant to go and investigate. He discovered the pump had a problem and adjusted it so that the water could flow again. While there, he offered to provide a system to irrigate the land which he will install at his own cost. So, what HAVE we got in our hands? We, The Church, have land, water and fencing and we need to take it further.We need those who are willing and able to offer to help prepare and plant this land.As a church we can pull together. It’s up to us to go forward. What resources do you have? What has God given you? Get in touch with CAST and help us carry an eternal message of hope to others.